Longueur totale 64cm. cordon noir pour lunettes. N’oubliez pas de m’ajouter à votreliste de favoris ! En cas de souci avec votre commande. Material:Nylon mit Kunststoff-Schieberegler. Dabei werden die Gummischlaufen am Ende des Bandes über die Brillenbügel gezogen. Passend für viele Brillenarten (Lesebrillen, Sehhilfen oder auch Sonnen- und Sportbrillen). NEW Peppa Pig Sunglasses / Glasses Strap. This cute elasticated glasses strap is a great way to keep your children's glasses close to hand. The strap has a fun slider to adjust the strap in place against your child's head. 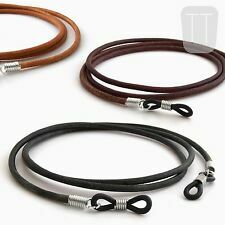 This adjustable strap will fit most styles of eyewear with its universal adjustable rubber loop connectors. It has a 'slidelock' slider to adjust the length of strap enabling it to be worn around the neck or against the head, an effective way to keep your valuable eyewear secure. 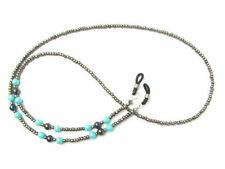 Stunning Glass Beaded Glasses / Sunglasses Strap. These pretty retainers are manufactured to a high standard and not only are they very fashionable but will keep your glasses close to hand and most importantly safe and secure. NEW Lilac Lolly Pop Sunglasses / Glasses Strap. This cute elasticated glasses strap is a great way to keep your children's glasses close to hand. The strap has a fun slider to adjust the strap in place against your child's head. This Glasses Sports Band is made from Neoprene ( a material used for sportswear ie, wetsuits ) and when in use is positioned securely at the back of your head for added security when wearing your glasses in sporting activities. NEW Pink Car Sunglasses / Glasses Strap. This cute elasticated glasses strap is a great way to keep your children's glasses close to hand. The strap has a fun slider to adjust the strap in place against your child's head. Original Gorilla Grip Glasses Holder Perfect for Sports and Activity and those on the move. Fix the rubber ends to your glasses and they will not move. This strap will keep your glasses close by and secure. They are easy to use and comfortable on the ear. These are for childrens glasses with glasses temples which are not larger than 5mm wide. (style 1 - square). Colour: Peach with pink & green floral patterns. NEW Retro Floral Sunglasses / Glasses Strap. 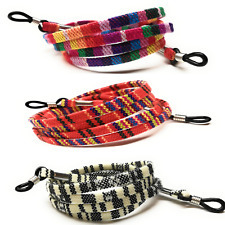 NEW Unisex Multi Coloured Sunglasses / Glasses Strap. This retainer will fit most styles of glasses / sunglasses with its strong universal adjustable rubber loop connectors. 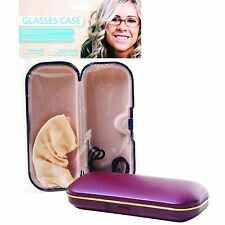 They are an inexpensive & an effective way to keep your valuable eyewear close at hand and safe from dropping or scratching. Fix the rubber ends to your glasses and adjust the strap to fit around your head. 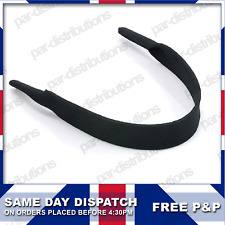 This strap will keep your glasses stable whilst doing any activity or sport. Can be extended so will suit Adults and Children alike. 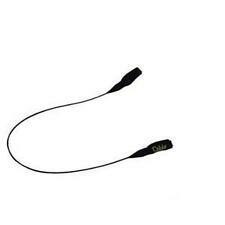 It has a slider to adjust the length of strap enabling it to be worn around the neck or against the head, an effective way to keep your valuable eye wear secure. 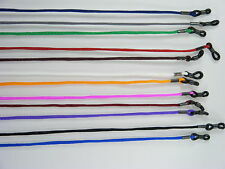 NEW Adjustable Sports Glasses/Sunglasses Strap. Sunglasses / Glasses Strap. NEW Unisex Stud Effect. Sie suchen eine elegante Brillenkette die nicht alltäglich ist?. die Kette ist ca. 70cm lang. Das Foto ist mit natürlichem Licht gemacht, ohne Blitz, daher kann die Farbwiedergabe abweichen. Sie kaufen also ohne jedes Risiko! Great for sunglasses and prescription glasses. 1X PINK RUBBER 3mm thick. 1 X BLACK RUBBER 3mm thick. or they have. we have for sale. 8 x Baumwoll Brillenband Brillenkordel Brillenschnur in 2 verschiedenen Designs. je ca. 70 cm lang und ca. 0,5 cm breit. Nur so kann ich wirklich auf Dauer die Preise halten. 1 X DARK BROWN REAL LEATHER. silver tone.